General St. Clair and his men had marched all day and into the early darkness on that cold November day in 1791. Without making proper defensives the men bedded for the night. This was the opportunity the Shawnee Chief Little Turtle had been waiting for. 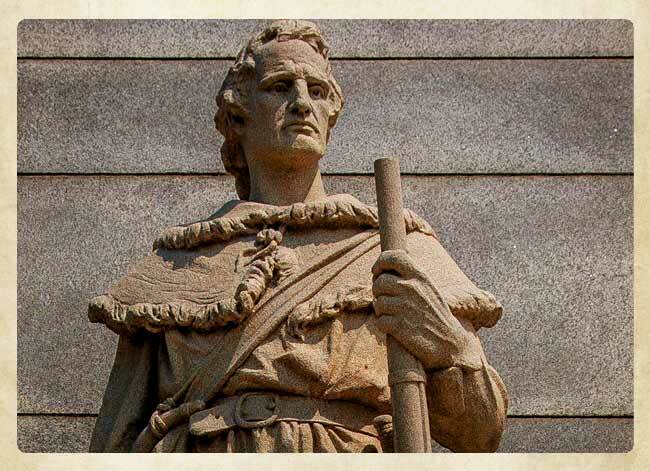 As dawn broke the next day the Indians attacked from all sides, General St. Clair and his weary men were trapped along the bank of the Wabash River. The battle would last several hours and in the end be a decisive victory for the confederation of Indians. The Americans were able to break out of the trap and the survivors made their way back to Fort Jefferson. On the banks of the Wabash River, 900 Americans lay dead or dying. It would be 2 years before General Wayne arrived at the battle site. He would build Fort Recovery and gather the remains of the fallen soldiers. President William Howard Taft signed a bill in 1908 to build a monument to the men who had fought there. The monument was dedicated July 1, 1913. 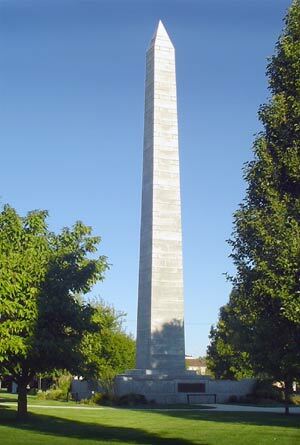 The obelisk stands 101' 4" tall and weights 800 tons. Under the base are the remains of about 1200 soldiers killed in that battle known simply as St. Clair's defeat. In 1891, their remains were moved from Pioneer Cemetery and put in 2 vaults under where the new monument would be built. Medallions are placed on the stone around the base for the 32 officers who also died that day. A 9' frontiersman stands in front, looking west toward the Wabash and the land beyond. Fort Recovery Ohio remembers every Memorial Day with the placing of 900 white wooden crosses in the soft grass around the monument. The park is located at the corner of OH-49 and OH-119 in Mercer County. The current monument is actually the 2nd monument built on the site. The first Fort Recovery Monument was made from wood with a natural gas light that ran through it. High winds blew down the original monument.